It is hard to write a considered review of a book that has affected one emotionally. This book is inspiring, emotive and eye-opening. I have never been to Hackney. I fear London. There is a side of me that despises it. This is the seat of our utterly disappointing government, the home of evil bankers, vacuous celebrities and relentless musical theatre. London decides what to watch, what to visit, what is best and fashionable to wear, what to listen to, to read, to eat. It is faceless and monstrous, the twisted soul of our country. I figured that the writer could be singing from the same hymn-sheet. In many ways his book reveals an attitude far more complex than that. Whilst he despairs at the encroaching development of London into the edges of the Marshland in Hackney it is also clear that were it not for earlier developments such as the railway it would not exist. Significantly it is the meeting of these two worlds – this island of nature and the bizarre mix of architecture and industry – that creates a synergy. A little universe in which the strange will occur. A world in which the mundane and the surreal collide. This little world sticks its middle finger up at the city with such defiance that it crackles with an other-worldly energy. It is this margin that Gareth Rees explores. Like a 21st Century Kay Harker, he explores a world in which the lines between imagination and reality are continually blurred. In Masefield’s “The Midnight Folk” we constantly question whether Kay is dreaming or awake and the sensation is similar here. By placing the real; the architecture, news reports and stringent historical research, alongside the unreal, we are plunged into a vortex of monsters, bears, time-slips, shamen and hallucination. The book explores the geographic reality of the Hackney Marshes, but overlaying this in soft swirls of mystical graffiti are utterly compelling tales inspired by or pulled from Mr Rees’ study of the area. It appears that his study is a mix of hard graft and rambling through the Marshes with his dog Hendrix. Rees introduces us to a man who transforms into a bear, two unfortunate time-travellers and an unhappy couple who find themselves possessed and changing into the occupants of a demolished factory. We meet the occupants of a barge from London’s netherworld, explore the legacy of the Olympic Village whilst visiting a mystical peddler in contraband antique books. This scratches the surface and I would urge you to seek out this book to discover more. It was into this margin that a deer ran across our path. We were in the town yet not in the town. We were in the country yet not in the country. I had discovered the margin between worlds. I hadn’t looked for it before. Thumb Rivera is a small time drug dealer who makes the mistake of trying to get in league with the local biker gang, which ends badly for him. American Ghost follows his efforts to solve his own murder from the afterlife. Paul Guernsey’s third novel is basically a supernatural detective story with a heavy dose of dark Americana, featuring backwoods biker club houses, trailer meth labs and abandoned murder houses. The story is structured in an interesting fashion, with Thumb’s spirit travelling through time and space, with no knowledge of how the afterlife works, this being revealed slowly to him via other trapped spirits he meets on the way, including the ghost of a man who died in a road accident, who now lingers in the spot he died. By and large Thumb has to observe how life moves on without him, but learns to communicate with two living people, a hapless ghost hunter and a pig farmer who is also a frustrated novelist, who provide a conduit to the land of the living. The story is well constructed and keeps you engaged as the plot unfolds, as Thumb comes closer to discovering who killed him and why. The afterlife Guernsey constructs is fascinating, with it’s own internal logical and laws. I’m not usually much of a fan of crime fiction, but this supernatural twist on the murder mystery made it much more enjoyable. If you fancy a haunting (in both senses of the word) mystery novel, then this is for you. 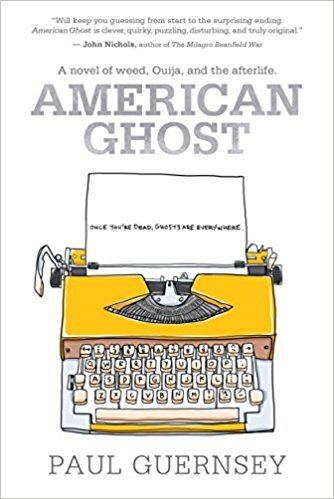 Paul Guernsey also edits The Ghost Story, which has much of interest to revivalists. The Snow Witch is both a haunted and haunting book. Though not a ghost story as such, it is swarming with ghosts – the ghosts of the past, the ghosts of winter, breath ghosts. From the bleak frosty shore to the black, black sea, Wingett tells the tale of a lonely, insular refugee from the east of Europe who finds herself in the cold season days of a British seaside town. There she encounters strange kindness but also becomes the victim of a harrowing experience. The tale is infused with humanity at its rawest, its nastiness but also its generosity. Like a favourite author of mine – Ray Bradbury, Wingett skilfully paints a scene in words with painterly strokes; in my mind when reading I could see the twinkling of the model village lights in the darkness of the drawn in evenings and feel the bite of frost upon my fingers. I found myself immersed with the events playing out in my mind like images upon a cinema screen; for me that is the mark of a skilled writer. Also adept and engaging are the characterisations of the figures prevelant in the narrative – from the enigmatic otherworldliness of Donzita, the enduring grief of Celia, the shy awkwardness of Eddy, the wilful desperation of Vee and the low, selfish cruelty of Riley. At times The Snow Witch is raw, unafraid to confront the unkindness of life but it also shines the beacon of hope and illuminates magic and maintains its air of cold, ethereal beauty throughout.